How do we engage with our clients when it comes to RadicalRooting™? What is it that we do exactly and what is this process all about? RadicalRooting™ is a 4-step process that enables Insight to approach a client’s business in a methodical manner that eventually gives both, Insight and the client a clear view of what is required, what needs to be done and how it can be measured for success. Let’s assume that you approach us to build an e-commerce website, and you have your requirements for the website well thought out with details on what features you wish to see and how you want the transactional system to function, etc. You want to increase revenues to US$ 1 million in the next 6 months by way of sales generated through the e-commerce site. You believe the site can increase your revenues by 100%. However, you may not know or share the factors that will influence this jump in revenues, through the e-commerce site. 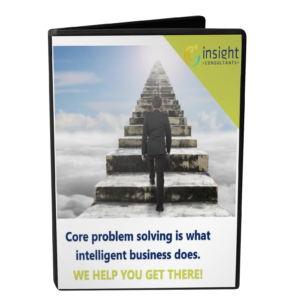 Insight partners with you not just to build your business solution, but primarily to understand the influencing factors for success or the problem that the solution is expected to solve and ensure you have a handle on if you get the value that you anticipate. At Insight, our RadicalRooting™ methodology is devised in such a manner that we will flesh out your ideas only after we make sure that it gives you a clearly identified value and we will help you measure if that was obtained. In cases where a clearly identified value does not exist, Insight performs an RCA (Root Cause Analysis) to find out the exact value or expected benefit that the proposed solution can bring to the table, and if the solution will indeed solve the problem being addressed. Insight also works alongside to clarify and set expectations throughout the problem solving and solution development journey. We estimate cost of project along expected solution benefits to validate that your return will be greater than your investment owing to those benefits. 1. Pre-Sales Process – When a business approaches Insight, the first step is the RCA (Root Cause Analysis). 2. Requirement Analysis – Understanding and recording the perceived solution and expected business benefits in a pre-determined format. The team at Insight believes in shouldering the business issue and being an equal stakeholder in finding the right and intelligent business solution for increased business value. It is critical for any business to be clear when stating their business concern or the expected benefit. It is equally imperative for the solution partner to ensure that all ambiguities are cleared before embarking on solution-finding. When you share your requirements with us, we ensure that you not only get clarity on what you want, but you will also be Wow-ed by what you get at the end of our analysis. 2. Interactive prototype – Flexible prototypes which allow you to make your own changes based on your preferences. 3. Impact : Prototypes with rich feature sets to top your base requirements, that comes from expert advice on features that boost the impact of your solution on the targeted user group. The Insight Consultants RadicalRooting™ process allows us to walk alongside you and ensure that you get the expected business benefits with our solutions. Contact us to help your company see true value.